Piperidine-Based Drug Discovery outlines the complexities of Piperidine scaffold use in drug discovery, including derivative chemistry, structural properties, methods of synthesis and practical implementations. Piperidine scaffolds are the cornerstones of over 70 commercialized drugs (including multiple blockbusters). 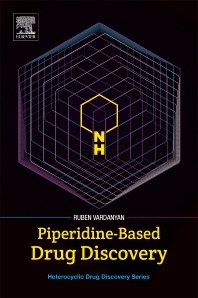 Designed as a guide for both experts and students working in this and related areas, it is hoped that this volume will encourage and inspire the continued design and development of novel pharmaceuticals based on Piperidine and its derivatives. Heterocyclic compounds are of central importance to medicinal chemistry, as demonstrated by the high percentage of marketable drugs that feature heterocyclic fragments in their structures. As starting points for drug discovery they offer a broad range of attractive properties, and a detailed understanding of the particular characteristics of each is of great benefit to researchers. The most commonly used heterocycle among US FDA approved pharmaceuticals, Piperidine is an extremely important building block in the synthesis of medicinal agents. This heterocycle and its derivatives exhibit a number of important functionalities and have been employed variously as CNS modulators, antiaggregants, anticoagulants, antihistamines, anti-cancer drugs and analgesics.